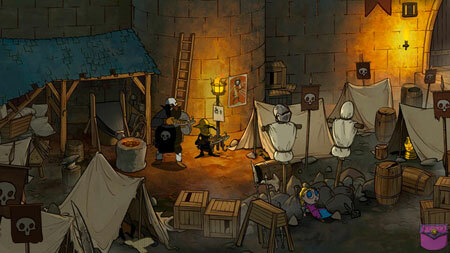 TSIOQUE is a dark point and click adventure game from OhNoo Studio, Smile. Escape the clutches of an Evil Wizard and discover the secrets hidden within the spellbound castle of your ancestors. You will take the role of princess Tsioque, a little girl with a talent for bringing chaos and destruction wherever she goes, imprisoned in a castle overtaken by the Evil Wizard. When darkness falls on your ancestral home, places formerly familiar suddenly turn unfriendly and dangerous. The castle walls have become a deadly trap. You must escape and thwart the Evil Wizard’s plans before the spell he has cast on the castle escalates, triggering events beyond anyone’s control. Before the Wizard’s attack, the castle held many secrets. Bound by a powerful spell, the castle not only became home to demons and magical creatures, but has also been affected itself by the evil power. It bends and shapeshifts, forming layers upon layers of transformation and illusion. If you get stuck in the game, check out the video walkthrough and gameplay for the game. This entry was posted in PC Games, Walkthrough and tagged TSIOQUE Cheats, TSIOQUE Game, TSIOQUE Gameplay, TSIOQUE Guide, TSIOQUE Hints, TSIOQUE Review, TSIOQUE Solutions, TSIOQUE Strategy, TSIOQUE Tips, TSIOQUE Walkthrough by Marvin. Bookmark the permalink.